A traditional wine merchants with industrial twist. The Brooklyn Pharmacy Dome Table Lamp provides an elegant yet efficient lighting solution to your interior, perfect for a home study or office. The table lamp works well with both modern, contemporary themes as well as traditionally classic, vintage interiors. 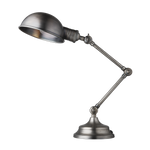 The adjustable light is IP20 rated and comes in a Gunmetal finish and is the perfect solution to light up an office or home study. Our Flat 8-inch is available with a matching Brooklyn wall light and flush mount, and is part of a set, with a slightly bigger variation also available. When used together, particularly when hung in 3s and 5s, the lighting makes for an urban setting that is truly harmonised and perfect for restaurant lighting. Small metal wall light sconce with Umbrella shade in vintage antique brass finish. Designed to showcase the warmth of Edison-style filament bulbs this vintage industrial antique retro style metal lighting fixture is ideal for urban homes, modern loft conversions, restaurants, bars and hotels. Handcrafted Original Bar Stool. Reproduction, designed to look vintage. The seat colour can be bespoke in accordance with your colour and style preferences and can also come in both adjustable or non-adjustable designs. 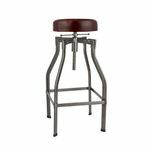 The perfect addition to any urban, modern home interiors or industrial-styled pubs, bars and restaurants that are embracing vintage interiors.